/ Where Can You Find Cinderella in Disney World? Where can you find Cinderella in Disney World? Cinderella is one of the most popular characters in Walt Disney World and she is not too difficult to find. 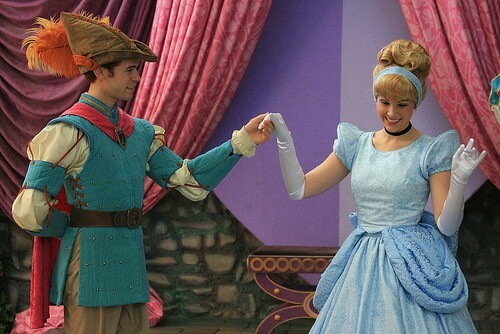 Here is a guide as to the best places to find Cinderella in the Disney parks and hotel resorts. Just remember the usual warning – all Disney character experiences are subject to change without notice. In other words altough Cinderella is expected to attend sometimes changes may have to be made at the last minute – it is the perogative of a Princess after all! Cinderella is most easily found in Magic Kingdom and Disney Storybook Princesses in Town Square is the first place to look. As soon as you arrive in Magic Kingdom you need to check the times of the Princess meet and greet in this location. As always, there is no guarantee that Cinderella will be there but your chances of finding her are pretty good here. There is pretty much always a long line but a Fast Pass is available. The Disney Dreams Come True Parade is a guaranteed place to see Cinderella – but of course you won’t be able to talk with her or get her autograph here! Cinderella will be with Prince Charming on the A Dream is a Wish Your Heart Makes float. This parade usuallly takes place at 3pm each day but you must always check the up to date times before you visit. Dream Along with Mickey is a stage show which is performed several times at day in front of Cinderella’s Castle. Again check show times on the daily schedule. This 20 minute show is well worth seeing and Cinderella and her Prince Charming appear along with lots of other Disney favorite characters. Watch out for Maleficent who is as always intent on spoiling everyone’s dream! Cinderella appears in on of the most beloved of the Disney Parades – the Main Street Electrical Parade. Cinderella appears in her magnificent Pumpkin Coach with Prince Charming and The Fairy Godmother. As will all parades times vary so check your park schedule. As you would expect you can find Cinderella in her own castle. But unfortunately for this meet and greet you do have to get one of the most difficult to snag Disney restaurant reservations in the whole of Walt Disney World. Cinderella’s Royal Table restaurant is actually right inside Cinderella castle. This makes it the most popular restaurant in Disney World so you do need to get those Advance Dining Reservations as soon as you can. Cinderella and Cinderella, The Fairy Godmother, Princess Belle, Princess Aurora and Snow White are all likely to attend The Royal Table. This is a photo package dining experience. This means that you have the chance to have a photograph taken with a Princess (usually Cinderella) and your party will get a package of prints of your photo. This is included in with the price. So Cinderella’s Royal Table is a pretty reliable spot to find your favorite Princess but it is certainly not the easiest or the cheapest. Breakfast, lunch and dinner is served. The least cost option is the breakfast at $44.80 for adults and $29.86 for children aged 3 to 9. You may like to read Cinderella’s Royal Table – Is It Worth It? Another chance to dine with your favorite Princess is Cinderella’s Happy Ever After Dinner at 1900 Park Fare at Disney Grand Floridian Resort. Cinderella, Prince Charming, Lady Tremaine, and Anastasia and Drizella are usually in attendance. This is one of my favorite Disney character dining experiences as the food is of high quality for a buffet, and you get plenty of chance to see the characters. The price is $42.59 for adults and $21.29 for children aged 3 to 9. This includes tax but not gratuity. You can also use 1 Disney Dining Credit if you are participating in the Disney Dining Plan. This one is a long shot as you really cannot reliably expect Cinderella to be there. If you are looking at character dining to see Cinderella then 1900 Park Fare and Cinderella’s Royal Table are your only reliable options. But if you want to see the other Princesses then this is a great option. Disney Princess Storybook Dining is located in the Akershus Restaurant in the Norway Pavilion in Epcot World Showcase. Where Won’t I Find Cinderella? Cinderella only really likes to be in Magic Kingdom and The Grand Floridian Resort. Occassionally she may be seen in Epcot in Princess Storybook Dining but she doesn’t often go there. She doesn’t visit Disney Hollywood Studios either. You definitely won’t find Cinderella or any other Disney Princess in Disney’s Animal Kingdom.